The Addison Fire Protection District contracts with an outside vendor, Paramedic Billing Services (PBS), to perform all ambulance and fire billing functions. Billing questions or concerns should be directed to PBS at (630) 530-2988 Monday thru Thursday 8am – 7pm, Friday 8am – 5am, Saturday 8am -12pm or via email at insuranceinfo@paramedicbilling.com. Bi-lingual customer service personnel who speak Spanish and Polish are normally available. If you are covered by medical insurance, Medicare, Medicaid or are a member of an HMO, please provide information about your coverage on the back of your ambulance bill and return it to PBS. They will bill your insurance carrier. If there is a balance still due after your insurance carrier responds to them, they will send you a revised bill. You can also securely upload your insurance card information via mobile web by going to www.paramedicbilling.com from your smart phone navigator. You can either enter your insurance information into the form or simply take a picture of your insurance card and upload it. Please Note: Individuals who are residents within the boundaries of the Addison Fire Protection District are not required to pay amounts above the amounts paid by their insurance carrier. You can use a credit card over the phone by calling (630) 530-2988. You can pay your bill securely online at www.ambulancepayments.com or by clicking here. Why does the Addison Fire protection District impose a fee for emergency ambulance services? The Addison Fire Protection District’s skilled paramedics provide emergency medical services, including ambulance transportation nearly 4,000 times per year. Persons needing these services within the boundaries of our district are served immediately, regardless of income or where their home address is, by calling 911. In order to supplement the high costs of providing these services, the AFPD uses available reimbursements from Medicare, Medicaid and private insurance companies. These fees save our district taxpayers money by enabling the district to shift some of the cost of providing these services to the user or their medical insurance. If you were transported to a hospital by an Addison Fire Protection District ambulance, you should expect to receive an ambulance bill within two weeks of transport. Because of the emergency nature of these services and because your health and safety is our primary concern, our paramedics are not always able to obtain complete or accurate billing information at the time of the transport. Call our billing company, PBS, at (630) 530-2988 for a copy of your bill, or for any other assistance. Why does the Addison Fire Protection District impose fees for fire services? The Addison Fire Protection District receives tax money to pay for it’s operations from residents and businesses within it’s boundaries. 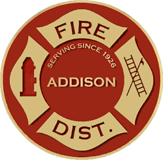 The Addison Fire Protection District imposes fees for fire services to individuals and businesses who do not pay taxes to the Addison Fire Protection District in order to offset the costs of these services. These fees save our district taxpayers money by requiring fees for those who do not pay taxes to the AFPD, but still received our tax payer supported services. Question about billing for fire services can be directed to PBS at (630) 530-2988.